Genoeva Galicia was called home to be with our Lord and Savior January 27, 2019. She was born April 28, 1943 in Raymondville, TX to the late Thomas and Genoeva Hernandez. siblings; Thomas Hernandez, Lupe Hernandez, Isreal Hernandez, and Noel Hernandez. She was preceded in death by her husband Hershel Joe Galicia, siblings; Ralph Hernandez, and Cecilia Gutierrez. Genoeva loved playing and especially winning at BINGO, as well as the Loteria, UNO, and on her tablet. She also enjoyed watching old western movies. Genoeva cherished the time spent with her family and friends. 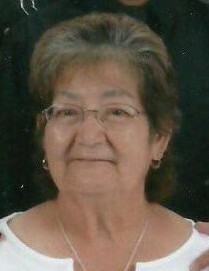 She was a wonderful mother, sister, grandmother and great grandmother who will be deeply missed by all that knew her. A rosary service will be 5pm to 7pm Thursday January 31, 2019 at Chapel of Grace Funeral Home. A mass of Christian burial will be celebrated 12pm Friday February 1, 2019 at St. John the Baptist Catholic Church with interment following at Peaceful Gardens Memorial Park.